Join hands with Neighbors Near and Far this October to build a global economy that works for everybody! Sign up for Jubilee Weekend Today! 1) Pray for a global Jubilee for the world's poorest people. 2) Reach out to congregations in their local area to encourage them to get involved in the Jubilee movement. 3) Take action to support their global neighbors by educating their local communities on the connection between debt and Ebola in West Africa. 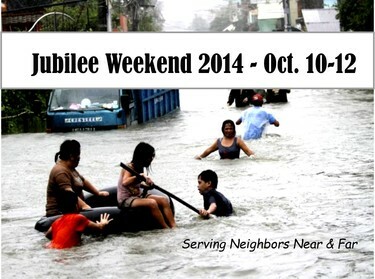 Jubilee Weekend links Jubilee USA with the global Jubilee movement that spans more than 50 nations. Around the globe, our partners take action to promote economic policies that serve, protect and promote the participation of the world's most vulnerable. In one global voice, we come together to act, pray and worship to put an end to global poverty. Thank you for your participation in Jubilee Weekend, 2014! Sign up today by emailing Ljubica Salamic at development@jubileeusa.org!